Laurie Kerr, Director of Advocacy, Urban Green Council. Ms. Kerr spearheaded the passage of Local Law 84 and then its initial implementation. Constantine Kontokosta, Deputy Director and Professor of Urban Informatics, Center for Urban Science and Progress, New York University. He works with City agencies to develop analysis and visualization of the data coming in through benchmarking reporting, as part of his larger mission to use big data analytics to address a variety of urban challenges. Cliff Majersik, Executive Director, Institute for Market Transformation. He has advocated on behalf of benchmarking laws nationwide, supporting most of the 17 jurisdictions, which have enacted benchmarking and transparency laws. Jeff Perlman, President, Bright Power. Mr. Perlman heads the largest single producer of benchmarking data in New York City, helping owners with mandated reporting, as well as with complex energy audits and retrofitting. 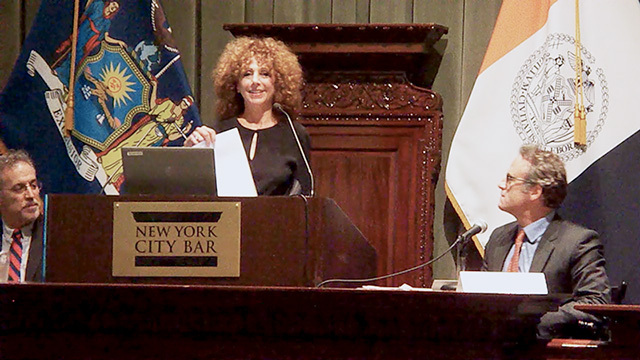 Serving as moderator, Stuart Brodsky, Professor, Schack Institute of Real Estate, New York University. He was the driving force behind EPA's Energy Star Portfolio Manager, an online tool used by Local Law 84 to report on covered buildings. 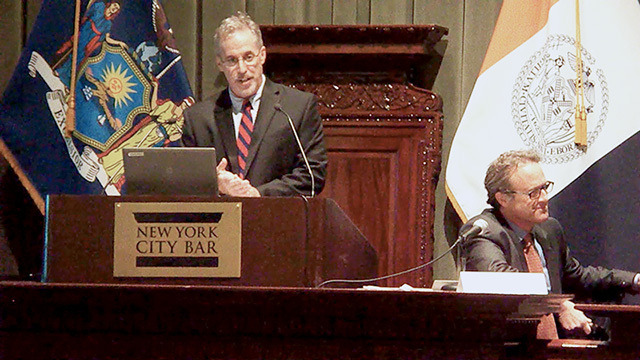 As the host of the evening's panel, Michael Mahoney, Chair of the Environmental Law Committee of the Bar Association of the City of New York kicked off the evening by underlining the significance of coming to grips with information about energy performance in the urban built environment. 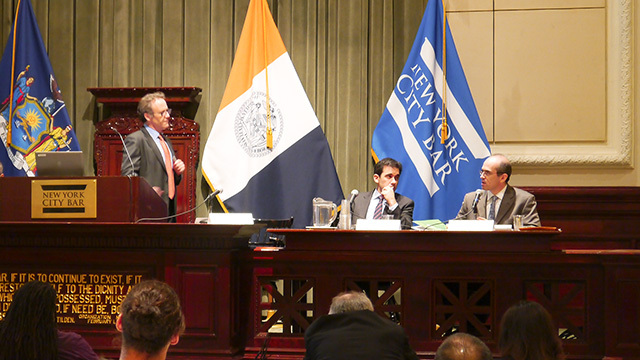 Michael Gerrard, Director of Columbia Law School's Sabin Center for Climate Change Law set the stage for the panel. Noting that buildings are the single largest polluter in the urban context and the urgency of reducing greenhouse emissions, it is clear benchmarking is a central and critical means to track pollution and reductions. For Nancy Anderson, Executive Director of the Sallan Foundation now is the time to ask questions that both look back and peer forward toward the emerging impact of building benchmarking. The wealth of data being produced by benchmarking reporting has the potential to change energy usage and behavior for building owners, occupants and advisors, but it is unknown if potentialities have become realities. Quoting Bob Dylan, Dr. Anderson throws out this challenge, "Change is happening here, but you don't know what it is, do you Mr. Jones?" The brain trust of benchmarking has been asked to address three pressing questions: Is the law effective today in changing behavior and cutting energy usage? What will be the future impacts of building energy benchmarking? And are we going fast enough in cutting GHG emissions to meet the City's 80x50 goal and what role is benchmarking playing in this campaign? Professor Brodsky began by asking the panelists to make the case for building energy benchmarking laws. Cliff Majersik emphasized the potential value-add of benchmarking, noting that we cannot value what we do not measure. Benchmarking can help improve energy usage in a building, enhance the accuracy of appraisals, and make buildings more competitive as they become more resource-efficient and healthful places to work and live. Laurie Kerr focused on making benchmarking data more accessible. Through the efforts of the Urban Green Council, the raw data released by the City is being repackaged and posted in a form that can be easily accessed and interpreted by the public. Once "Metered NYC" is launched (the beta version has been made available), occupants and property owners alike will be able to compare how properties performed in comparison to their peers, their neighbors and other buildings within specific ownership portfolios. When combined with anticipated improvements in data collection and reporting, benchmarking data will grow in its power by pointing owners and the public toward energy efficiency opportunities and will change behavior citywide. Constantine Kontokosta cautioned that energy data plays the same role as calorie information: individuals must have the will and knowledge to change behavior, not merely have access to information. Critical to the success of the benchmarking project is the tailoring of data to individual users and educating the public on what benchmarking data can and cannot tell us. 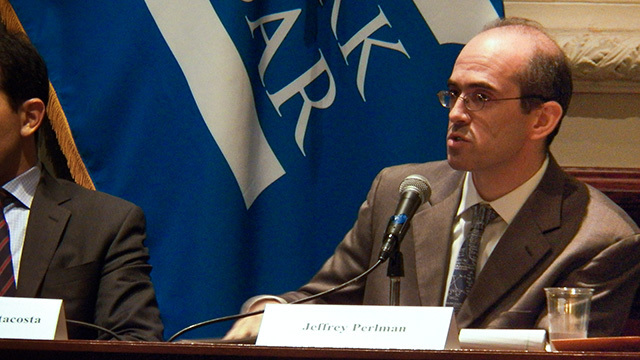 Jeff Perlman underlined the need to follow through from data-collection to analysis, to action and produce tailored reports that are good guides to decision-making. Analysis needs to track both across buildings in the same portfolio and use type, but also track performance over time by monitoring the effectiveness of commissioning, retrofitting, and other improvements and providing alerts for course corrections when performance does not meet expectations. 1. Has benchmarking been effective in changing behavior and cutting energy usage? Is the program a success thus far? Benchmarking laws are only enabling tools, noted Laurie Kerr. Their function is to require a look at initial conditions and allow for comparisons over time, which should show changes in behavior and energy performance. But there is no accounting for causation and there was never the intention that Local Law 84 directly led to reductions in greenhouse gas emissions. Rather, benchmarking is part of a larger package of building energy performance policies, (known as the Greener Greater Buildings Plan), which cut greenhouse gas emissions from our built environment. That said, there has been an immediate and significant reduction in emissions, just from basic tracking and attention to energy use, especially in government-owned or occupied properties. 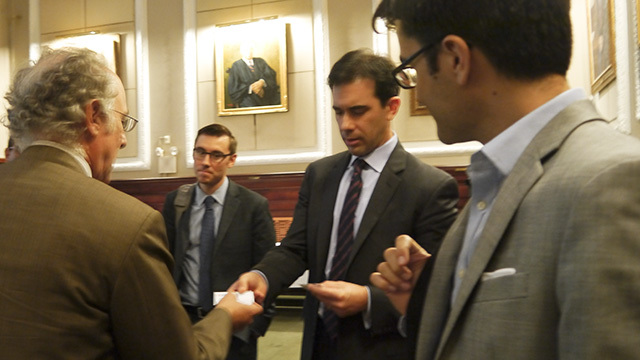 The effects of Local Law 84 have been hard to determine, Constantine Kontokosta argued. New York has only four years of data, and while energy intensity has decreased in the benchmarking sample, some accounting must be done for events like Hurricane Sandy, changes in occupancy and use, and other factors the influence energy consumption over time. A fuller picture can be developed, but only by the sophisticated merging of a variety of data sets, like commercially available CoStar information and the City government's PLUTO database. Still, we have already made some interesting discoveries; for example, pre-1930s buildings, when controlling for other factors, are more energy efficient than many newer buildings. Cliff Majersik focused on the difficulties in moving the conservative and slow-moving real estate industry, which operates on the "if it ain't broke, don't fix it" principle. Property owners operate on a long time frames and the benchmarking program has to be measured on a scale to match. From this point of view, a four-year data set is only a blink of an eye. And yet, there has been significant progress in just a few years; today, new buildings are routinely marketed as "green," and other cities are jumping on the benchmarking bandwagon. A US Department of Energy impact study found a 6% reduction in energy usage since the New York City law was enacted in 2009 but this reduction cannot be definitively attributed to benchmarking. A recent analysis of National Council of Real Estate Investment Fiduciaries data by Resources for the Future attributes an average 3% reduction in energy use for buildings covered under benchmarking laws. Clearly more analysis is needed. It is astounding to realize just how little we know about the energy footprint of the largest energy users in our economy – our buildings. 2. 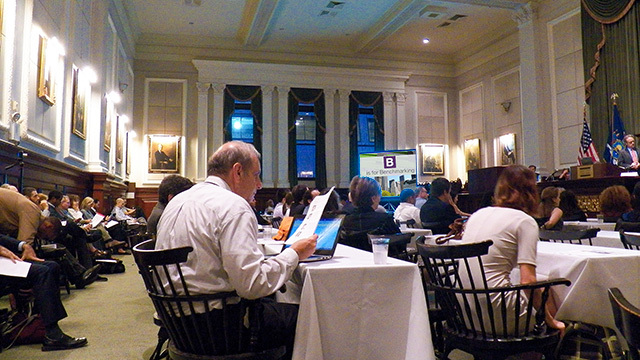 What future impact will benchmarking have on building energy performance? Is change coming to energy use in buildings across the city, regardless of their size? 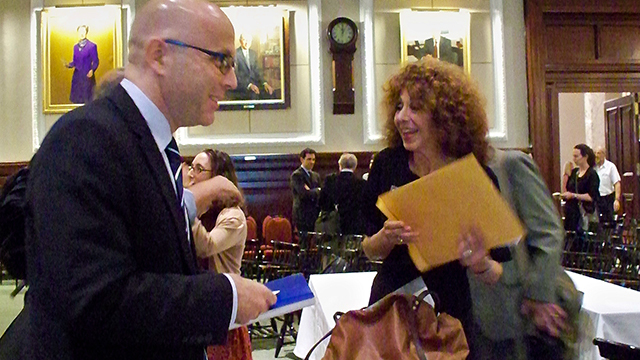 Stuart Brodsky advised that we need to understand how any market mechanism, including public disclosure, is effective for the substantial portion of the property market that is in buildings of less than 50,000 square feet (the size threshold for Local Law 84's disclosure requirement). For over fifteen years, owners of larger commercial buildings have been increasingly responding to demands of institutional investors and corporate tenants that need to demonstrate their own commitment to the environment. Even if those owners are given further incentives because of LL 84, and even if some of that incentive is to avoid the risk of being exposed for owning an inefficient building, how does any of this affect the owners of smaller buildings? In smaller buildings, it is likely there is neither the demand from lenders or investors, nor demand from tenants or prospective tenants. Further, where large buildings may be staffed by property management professionals, smaller buildings are not. Cliff Majersik suggested benchmarking and energy efficiency are more likely to be embraced quickly by owners with the largest buildings and largest portfolios, with best practices spreading from there. Constantine Kontakosta pointed out that 45% of the relevant energy use is in Local Law 84-covered buildings, which make up a small percentage of the total number of structures in the City. Furthermore, the economics of energy monitoring and efficiency have been shifted, by placing the start-up costs on those most able to afford it — the owners of larger buildings — thus making it possible for smaller buildings to follow in their footsteps in the near future. Jeff Perlman highlighted the easy efficiencies he is often able to find, as a result of low-performing building systems or operations, which can amount to a 10–15% reduction in energy use. Additionally, clients with large portfolios, have the opportunity to look across their buildings to tackle their least efficient buildings first, as part of a routinized cycle of maintenance and upkeep. Highlighting how his firm has developed scorecards for clients that are more market-oriented, Jeff Perlman described his efforts to create more directly actionable information. His firm works directly with owners to find cost-efficient solutions, not stopping at the mere collection of information to satisfy the letter of the benchmarking law. Moreover, by aggregating data from both the benchmarking law and Local Law 87, which requires building energy audits and retro-commissioning, it has become possible to predict the inefficiencies of any multifamily building in the city. This creates the potential to sharply reduce the cost of performing building-by-building audits, which has been a major barrier to small buildings that might want to shrink their energy usage and carbon footprint. 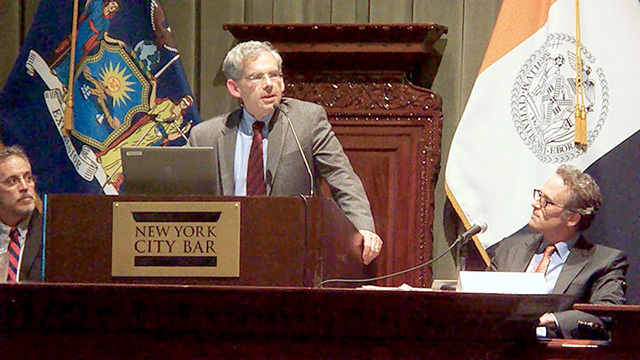 Perlman said that opportunities for enhanced energy performance exist throughout all types of NYC buildings, and that his company's recent analysis of the LL87 data, done in conjunction with the Building Energy Exchange suggests that some of the largest low-hanging fruit opportunities are in post-war buildings, especially those with oil-fired heating and hot water systems. Laurie Kerr made the case that Local Law 84 provides owners with the opportunity to change their behavior, make their assets more efficient and to avoid potential public shaming. Everyone has a chance to dramatically improve their energy performance, since building operations are the low-hanging fruit. People care about what others think, and that is leverage that can be used to help reduce emissions. Benchmarking is a first step in finding systemic problems and then bringing solutions to bear. 3. Are we going fast enough in reducing GHG emissions to meet the City's 80x50 goals? What specific role does benchmarking play in the campaign to cut its carbon footprint? 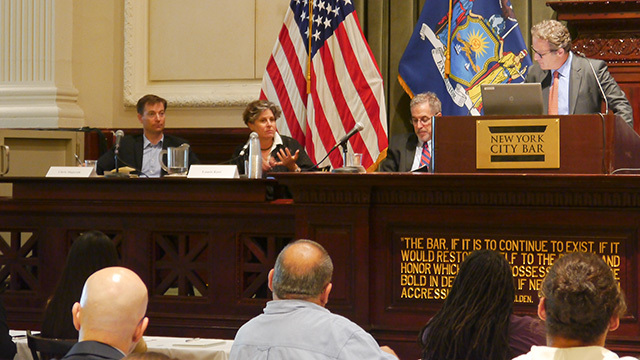 Laurie Kerr provided rough calculations for meeting the New York City law stipulating an 80% reduction in greenhouse gas emissions by 2050. Achieving the targeted two-thirds reduction in usage for buildings would not alone get the City there, and other GHG emissions sources like cars and trucks must be addressed. At the same time, meeting the 80% goal will require greater reductions than the 40-50% target in the Bloomberg administration. That said, it must be underlined that benchmarking is a critical tool in determining what is physically possible and economically efficient. Local Law 84 data is at the core of any attempt to distribute reduction burdens with a semblance of fairness and efficiency. There needs to be development and deployment of a large toolkit of policy solutions, and we are only now getting started, using benchmarking to shine a light on what exactly might be needed: understanding the different types of buildings and uses and their relative efficiencies and inefficiencies. Constantine Kontakosta predicted that even with the retrofit opportunities identified through Local Law 87 data, which requires energy audits and building retro-commissioning, there would still be insufficient GHG reductions to meet the 80% goal. Therefore, we need to be looking for disruptive changes in the real estate industry in order to achieve major reductions in energy use and carbon emissions. Using benchmarking alone is not sufficient. For other things that will help, he cited experiments with remote sensing and other novel technologies to understand patterns of energy use across the city. Real time and interval data are the next step in tracking usage. Jeff Perlman estimated that the cost for benchmarking is as low as a penny per square foot and many easy gains still exist in NYC to increase energy efficiency, especially on the residential side. Benchmarking is a tool to monitor how reductions in other areas are going, for example the switch from carbon fuels to renewables. Cliff Majersik highlighted national and international benchmarking regimes as part of the wider campaign to reduce GHG emissions. California enacted the first law in 2007, but it lacked public disclosure requirements. 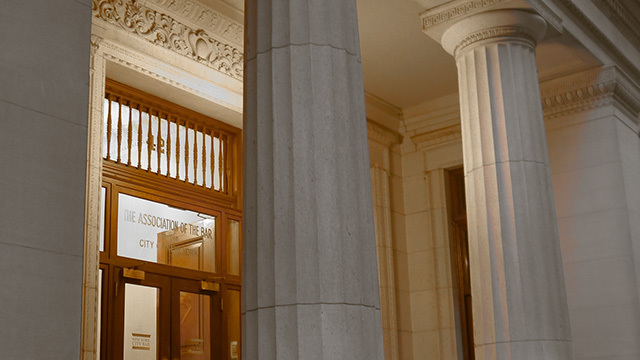 Washington, DC implemented a public disclosure law benchmarking law, which has become the national standard. In the European Union, some homes are required to disclose energy efficiency performance levels to buyers. While not yet working perfectly, conceptually, having information about every home for sale is useful for prospective buyers and puts pressure on homeowners to increase their properties' efficiency. Laurie Kerr highlighted the UK's laws, requiring the least efficient buildings to improve, as an important step to across-the-board energy efficiency. 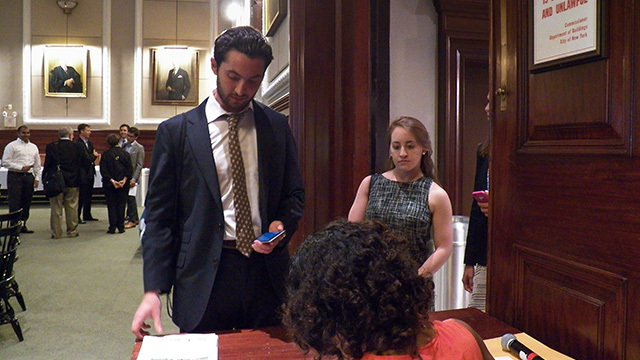 Michael Pisem is a 2L at the New York University School of Law. By providing an international platform for government, business and civil society to work together on low carbon solutions, CWNYC once again showed the world there are clear opportunities and benefits in joining the clean revolution. In its commitment to fully realizing the potential of building energy benchmarking, the Sallan Foundation convened the Friends of Benchmarking. 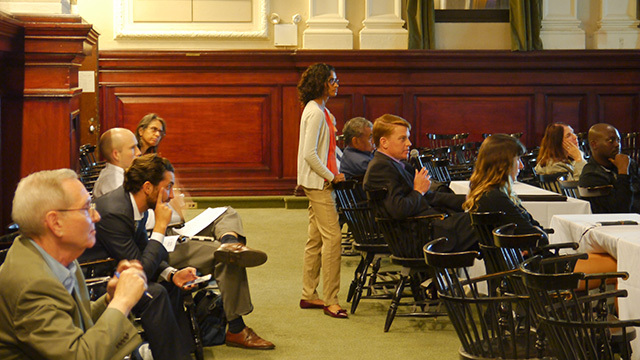 The FOB engaged in publishing two White Papers in order to clarify the purpose of NYC's Local Law 84, document its successes and identify challenges and solutions to advance the process of good environmental policy making and implementation. 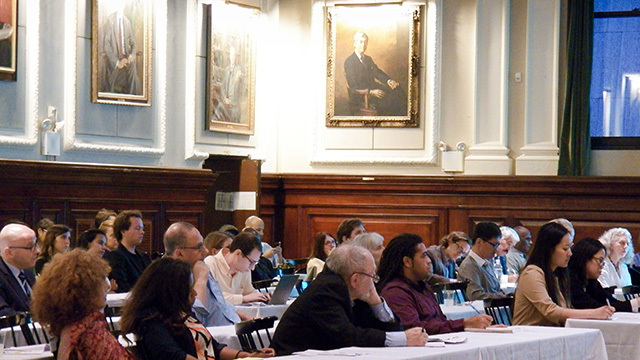 A one-stop resource provided by the City of New York to help owners and operators of privately owned buildings reduce operating costs and increase the sustainability of their properties through energy and water upgrades. Urban Green's new site to share benchmarking data in a clear, simple, engaging way. Stay up-to-date on the latest research, discover new green buildings and pathways to a greener city. Building Energy Performance: What's Evidence Got To Do With It? 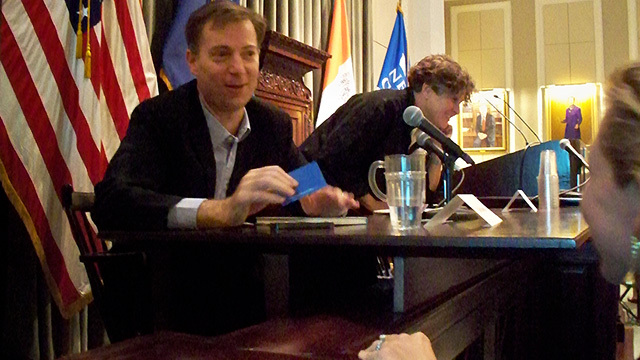 Anderson, Nancy, Ph.D., and Stuart Brodsky. Building Energy Performance: What's Evidence Got To Do With It? — The Sallan Foundation, 05 Oct. 2015. Web. 01 Nov. 2015. Could Energy Data Have Stopped the Clinton Correctional Prison Break? O'Neill, Leyna. Could Energy Data Have Stopped the Clinton Correctional Prison Break? — Bright Power, 23 June 2015. Web. 01 Nov. 2015. 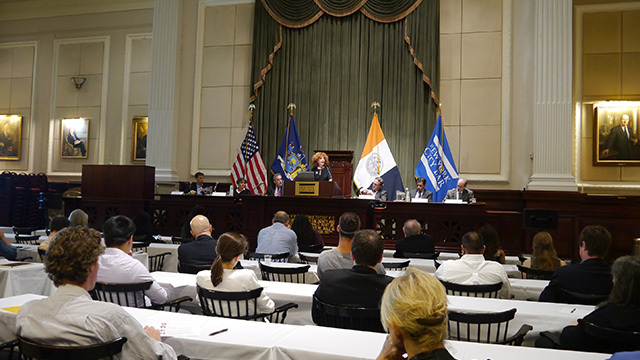 On Thursday, September 24, 2015, delivered remarks to those assembled at the Bar Association of the City of New York for Building Energy Benchmarking: Acting On Results, an official event of Climate Week New York City. Below is a transcript of those remarks. An audio excerpt of those remarks is also available below. NANCY ANDERSON: New York City's landmark Local Law 84/2009, the Building Energy Benchmarking mandate, is one of the singular achievements in the City's quest to cut its carbon footprint. And now, this law can serve as a power tool for helping to realize Mayor de Blasio's goal of cutting Gotham's carbon footprint 80% by 2050. Here's how: Local Law 84 requires property owners or managers to submit standardized energy and water use data to the City every year. Also, as required by law, the City has commissioned and has already published three annual benchmarking reports, which are posted on line and available to the general public. By the way, New York is not the sole American city with a benchmarking law; 17 jurisdictions have similar statutes on their books today. Looking just at New York City, some 15,000 large properties are covered by this ordnance, including office, residential, institutional and government buildings. By now, energy use data, standardized by submitters using EPA's Portfolio Manager software, has been collected for half a decade and the City's annual benchmarking reports should be required reading for everyone concerned with urban climate and energy policy. These reports serve as a unique lens that allows both stakeholders and the public to see deeply into the mass of data submitted to the City and to focus on the trends and patterns that are revealed. As such, these annual reports provide a potentially invaluable record for climate and energy policy makers as well as for concerned citizens. This is a record that is also of great potential use to property owners and managers, building occupants, investors and their professional advisors. Let me underline the word "potential". Supports of Local Law 84 have had shared expectations that gathering and disclosing benchmarking data would quickly be deployed in the form of useful information for guiding decision-makers to "low hanging fruit" actions with very cost effective returns. But, in fact, what is the evidence to support such expectations? In fact, is the benchmarking law generating actionable information? This evening, our brain trust of benchmarking will tackle those issues in light of experience to date and they will drill down into lessons being learned from the benchmarking mandate. Answering these questions will also cast a broad spectrum light on the impact of information disclosure laws, of which Local Law 84 is one example. The lyrics to an old Bob Dylan ballad have been haunting me," Because something is happening here, but you don't know what it is, do you, Mr. Jones". What if benchmarking laws are assembling superb information, but that information isn't actually instrumental in changing building energy performance? Now that more than 50% of the world's people live in cities and building operations and occupant use account for a significant portion of every city's carbon footprint, we've got to know what's happening here and do something big with that information. Otherwise, we'll be no better than the clueless Mr. Jones and, in our rapidly worsening global climate, that's simply unacceptable. 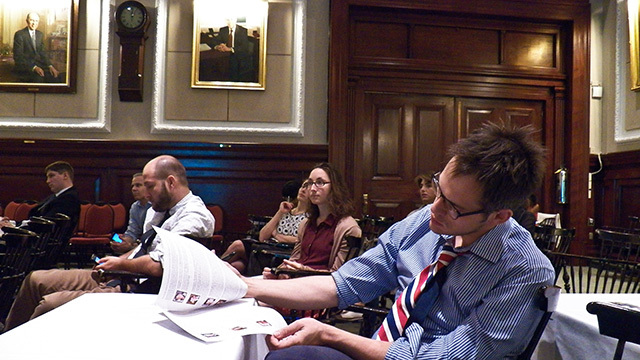 Jeff Perlman — benchmarking costs are not onerous. Special shout-out and thank-you to everyone who Tweeted live from our event.